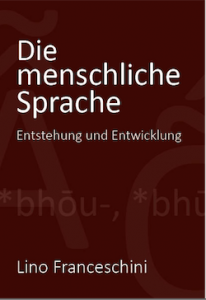 This book in german language is the result of longstanding research with the aim, to reconstruct processes that enabled the beginnings of language. Taking the research of place names as a starting point, the language development was traced back intensively with the conclusion that it is based on very simple processes. As sience teaches today, every phenomenon – however complicated it may be – is based on very simple elemnts. Everything in our world – from galaxies to botanic and human life – is composed of a few primitive parts. As manifold as nature is, its multitude of forms is based on variations of one and the same matter. Thus, only three primary colours can build an almost endless colour scheme and only seven notes can lead to an inexhaustible abundance of sound combinations. Besides, as modern biology teaches, life on earth has developed spontaneously: by a constant interplay of chance and necessity. At the beginning, language – as articulated by people living in a natural state – could only come to into existence and continue to develop according to processes normal in nature. According to the results of this research, language owes its beginning to one and the same basic idea of prehistoric man, the concept of growth which instinctively served as a model for shaping the first words. This happened by chance, spontaneously, and necessity, i. e. communication was essential. Thanks to the manifould variations of expression with the vocal cords this basic idea could be realized as first words by means of many different forms. By reduplication of these basic forms new words continued to come into existence, which by and by developed to a complex and sophisticated structure. In its beginning stage opposites were not expressed by differentiation but they were indications of one and the same visual concept. “Altitudo” means height as well as depth. “Bathos” can mean height, length, size and abundance at the same time. Beginning and end were inversive terms: it only depended from which angle you looked at them. The following inverse terms can be explained as an expression of a visual concept with the same meaning: concave and convex, abundance and emptiness, warmth and coldness, light and dark, time, space, colours, numbers etc. The concept of swelling, i.e. expanding, extending, growing up can be defined as a motor of language. This concept wants to explain in a simple way how human language was possible to develop. At the same time it offers linguistics a help for research capable of development. Linguistics has so far assumend the existence of an original language not present any more today and has tried to reconstruct this. Human language, however, has developed in an oral process going on for ten thousands of years, before writing was invented. The historical languages have emerged from dialects that due to missing written records cannot be grasped and reconstructed. When this nevertheless happens tricks are unavoidable. Our prehistoric ancestors did not have a written grammar at their disposal; neither could they arrange phenonema like phonetics, semantics and syntax which linguists still take for granted today. Language of prehistoric time was a means of communication for men living in nature. Only when language began to be written down for example by priests, poets, philosophers, grammarians, land surveyors and tax collectors was its spontaneity gradually lost. Even the written word does not guarantee a cultural language standardized in all grammatical phenomena, unless it is a dead language like Latin. How unsafe and therefore inexact the transition from dialects to cultural languages was can be deduced from many documented language monuments of Germanic tongue. It is therefore necessary to draw a distinct dividing line between prehistoric dialects and historical languages: because on the one hand we have a product of the spontaneous and the accidental, on the other hand the result of reason. It was only since the invention of printing, in Germany since the brothers Grimm and Konrad Duden, since the introduction of compulsory education and the existence of radio and television that the process of langugage standardization was more and more enforced. Nevertheless, langugae continues to chance costantly. How could there have been a standardized original language or a common language?